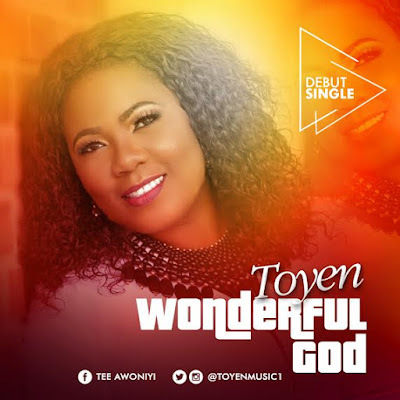 U.S. based Gospel Music Minister Toyen debuts her First Single “Wonderful God” a New single that professes the Power, Might and Glory of God. Toyen begun her music ministry at a young age, ministering in Church and singing in choir with several lead roles. 'Toyen' An Ordained minister got even more inspired to take her singing ministry to the next level after several years of listening to her Father, Mentor, and Life-Coach Rev Dr. Chris Oyakhilome. She declares boldly that she is a product of many of his meetings & Prophesy!!!! Toyen is Married to a lovely Pastor in the BLW nation, and blessed with two Sons. She says this song was inspired by the Holy Spirit, at a time when it seemed she was at her lowest, and while praying and speaking to the situation, this words began flowing out of her innermost being. “Wonderful God” is written by the singer/songwriter Toyen, arrangements by gospel sensation music minister John Godfrey, produced by Da genius. "Wonderful God" is also available on ITunes, Google plus, Amazon and some other online sales store.